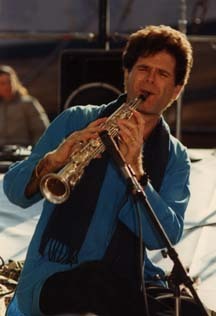 Steve Gorn on the soprano saxophone. 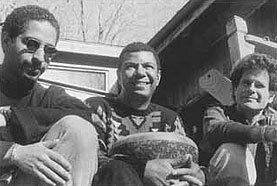 Steve’s first steps on this path were taken as a young jazz musician studying composition at Penn State. 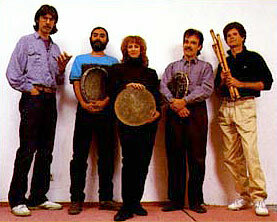 He noticed how John Coltrane and Charles Lloyd had begun to incorporate aspects of Indian music into their playing. He investigated modal music and listened to Bismallah Khan who played the shenai, (Indian oboe), and to Ravi Shankar and Ali Akbar Khan who were then only beginning to become known to Western audiences. Drawn by these sounds, he followed the music east and found himself in Benares, India in 1969, in a boat on the Ganges with the famous sarangi master, Gopal Misra, listening to his classical raga float out over the water in the evening light. In Benares, Steve studied shenai with a local teacher and then traveled to Calcutta where he was invited to meet the Bengali bansuri master Sri Gour Goswami. “We went to Hedwa in North Calcutta, passing through narrow lanes lined with sweet shops, tea stands and sari merchants. Bells were ringing from small neighborhood temples and the air was thick and pungent with everything from sandalwood incense to cow dung. We were directed to a doorway that led along a corridor into a small courtyard. A servant motioned to a room on the south end of the courtyard and we entered the stone compound. Seated on the floor, in a circle, were six men all dressed in white. In the center of the circle was a robust middle-aged man, his feet tucked under his dhoti, his lips red from the betel-nut he was chewing. A cup of tea was at his side and a harmonium and flute case lay on the floor before him. This was the teacher I had heard so much about. I was introduced in Bengali (although I learned later that these men spoke fluent English) and they proceeded to talk about me at length in a language I couldn’t understand. I stood there, grinning awkwardly, being discussed as if I were a specimen from Mars. Finally, the master looked at my flute case and said, “So, let me see your flute.” I took it out and gave it to him. He looked at it, shrugging his shoulders, “It’s not very good,” he said, “it’s not made right.” I started to say something but he continued, “Who did you learn from?” When I told him he let me know that I had learned from an insignificant person. 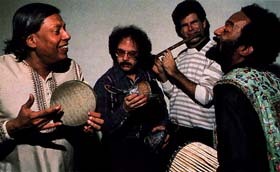 Returning to the U.S. he continued his study of Indian music with Pandit Raghunath Seth, and brought his elegant bansuri sound to American pop music, influencing a wide range of musicians, recording with Paul Simon, Richie Havens, Paul Winter, Jack DeJohnette, Glen Velez, and many others. 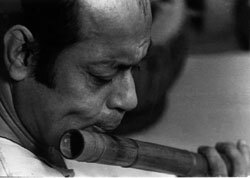 Deepak Chopra, Krishna Das, Coleman Barks, Jai Uttal, Jerome Robbins, and Julie Taymor are among those who have sought out his virtuoso bamboo flute. He has composed for film, television, dance and theatre, and performed in concerts and festivals throughout the world, drawing from classical Indian, jazz and world music to create a distinctive signature sound. His landmark world music recording, “Asian Journal,” and the unique “Wings and Shadows” have become cult favorites, and his acclaimed cd, “Luminous Ragas,” was named one of the top ten recordings of the year by Los Angeles Reader. Describing his 1996 performance in Mumbai at the Sangeet Research Academy’s Indian Music and the West Seminar, SRA West Chairman, Arvind Parikh has said, “Steve Gorn’s concert was widely appreciated for its outstanding musicianship…. and has won him a host of admirers.” In 1998, Steve returned to India performing to enthusiastic audiences at The Nehru Center, NCPA, and the Dadar Matunga Music Circle in Mumbai.